Your favourite shirt's got some new competition. Made from pure cotton and embroidered with an in-house designed floral print, its floaty bell sleeves and shimmering gold braiding on the inside mean you'll find yourself reaching for this top before all others. Nothing beats an embellished marl sweatshirt with a brushed inside – especially when it's decorated with embroidery and a touch of sparkly piping. 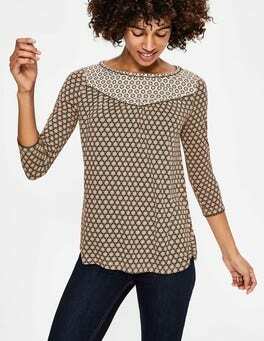 The relaxed drop-shoulder shape is perfect for slipping on as the temperature drops. A relaxed shape, billowing sleeves, brightly coloured tassels... This breezy cotton kaftan with in-house-designed embroidery is poolside perfection. Wear loose over your favourite bikini or cinch in with the waist tie – whatever suits you. Our relaxed-fit top in soft, breezy cotton is beach-ready with a boho twist. We've added delicate panel detailing to the sleeves and a blouson shape for extra flare. What's more, the braided cord and tassels at the neck give you something to twirl while you wait for your mojito. It's not difficult to see why our flattering Ravello Top is a bestseller. This V-neck beauty features subtle pleats at the neck, cap sleeves and a feminine shape that's perfect with both jeans and pencil skirts – the ultimate work-to-play style. 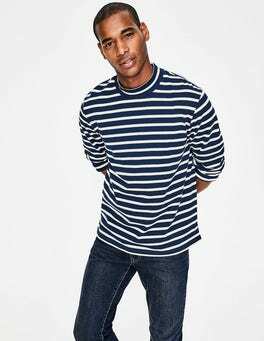 With its flattering boatneck, pocket detail and curved hem, this streamlined T-shirt is an everyday hero. Go effortlessly from coffee with the girls to a stroll in the park, all in a cotton-jersey fabric that's softer than ever. This embroidered Oxford-style shirt makes looking smart a doddle. The dinosaur design is made from 100% cotton for super-softness and is machine washable so it will survive (millions of) years. 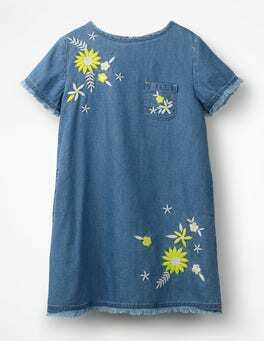 We took a sun-soaked meadow and turned it into this floral-embroidered denim dress. Frayed edges and an A-line design make it perfect for relaxing with friends in the long grass. 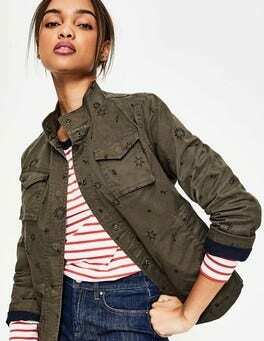 A zip back means it's easy to slip on, while patch and side pockets can hold plenty of daisy chains. Here at Boden, we like making every single minute of the day as comfortable and special as possible. 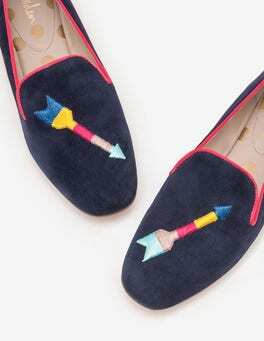 Enter our embroidered slippers, featuring intricate embroidered detailing in either puppytooth tweed or suede finishes. Each pair is lined with our signature spotty padded leather for extra support. The embroidered design and statement pattern of this A-line skirt make it the ideal any-occasion piece. It’s super flattering too, thanks to the smooth lining and above-the-knee length. An invisible zip at the back makes pulling it on for sightseeing trips fuss-free. Who loves to party? Astronauts (probably). This fully-lined velvet dress is just the ticket for those Space School balls. 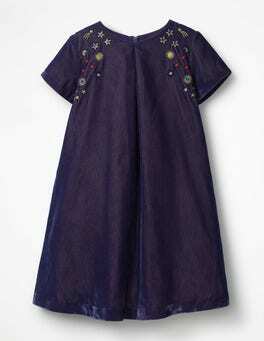 Decorated with sparkly stars, planets and moons, it's sure to impress passing aliens. The floaty sleeves and swing skirt were made for showing off those cosmic dance moves. The utility style of this versatile jacket demands a call to attention. Crafted from supersoft cotton with a stand collar, it features eye-catching embroidery and four roomy front pockets for all your essentials. Pull in the waist cord for a flattering fit or wear it loose for a laid-back look. This utility jacket is ideal for tackling fickle British weather. A transitional piece, it has a relaxed boxy shape – making it perfect for layering. With two functional patch pockets and in-house designed embroidery, it does practical and understated chic in one go. Embrace sunny days in this colourful dress. With striking embroidery on the neckline and sleeves, and a waist-tie for definition, you'll dazzle at dinner on the terrace. The bell sleeves gives a relaxed feel, now all you need is that mojito. 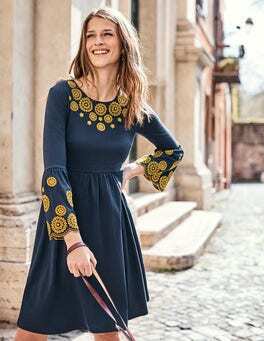 It's the embroidery and blouson sleeves that take centre stage on this midi dress. But that's not to say it isn't practical as the pure cotton keeps you cool in the sun and a flattering waist panel creates an easy-to-style shape. Just pop it on, add mules and you're done. Looking for a skirt that makes a statement? You've found it. Bold embroidery gives this structured A-line a playful personality. 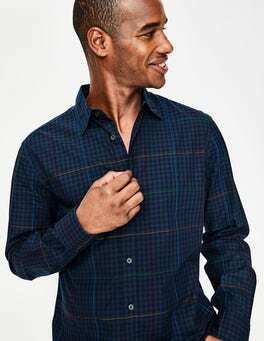 It's ultra comfortable, in soft moleskin cotton, and finished to perfection (naturally) with a contrast grosgrain zip. We added as many pretty touches as we could to this sweet sleeveless top. The elegant drapey design has dainty keyhole detailing and delicate pleats. A hook-and-eye fastening at the neck means you can wear it two ways: closed for a round neck or open for a V.
Floaty and feminine without being fussy? Our boho-inspired top shows us how it’s done. Cinched-in cuffs balance the blouson sleeves, while textured pintucks and a ladder-trimmed front give loose shape structure. It’s the perfect partner for your favourite jeans or trousers. 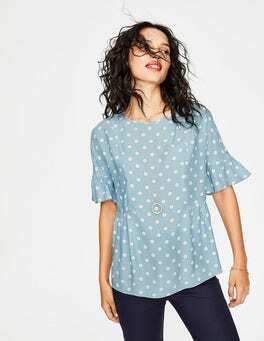 This top has more than a few tricks up its pretty sleeves. We embellished the neckline and cuffs with lace and ruffles, while a pintuck front panel gives this semi-fitted top some heritage charm. Pair it with jeans or tuck it into a fitted pencil skirt. …for a blouse with all the frills? Add this boho-inspired top to your wardrobe. With micro pleats around the collar and front for a feminine finish, it's perfect tucked into a midi skirt for demure style. Alternatively, leave the neck tie open and let the fabric flow nonchalantly over your jeans. Say hello to casual glamour. With its relaxed, lightweight fabric, our top couldn’t be more easy. The front is tiered for extra volume, while the V-neck ensures a comfortable and flattering fit. Simply throw on with your favourite jeans and head out the door. We firmly believe a little frill never hurt anyone. Case in point: this floaty, statement sleeve top, complete with playful print and flattering V-neck. Tuck it into a slim-fit skirt for smart-yet-bold look. Make space in your wardrobe for this versatile blouse – although it might not stay in there for long. With a bold V-neck that runs down to the fitted waist, it has an elegantly feminine shape. The gentle blouson sleeves with cinched cuffs give it just enough volume to amp up those everyday outfits. 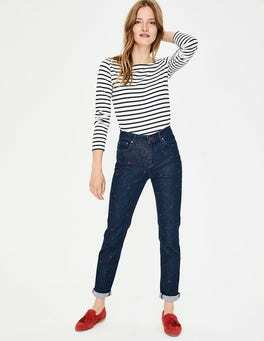 With a slim leg for a flattering cut, these girlfriend jeans are made from authentic denim that has just enough stretch to be comfortable (without losing its shape). Check out the side stripe option if you're looking for that extra wow factor. Embroidered top seeks owner for sunny, carefree times sipping iced coffees. Any takers? Made from soft slub cotton with feminine broderie detailing and a scallop trim, it's ready to take the main spot in your wardrobe. 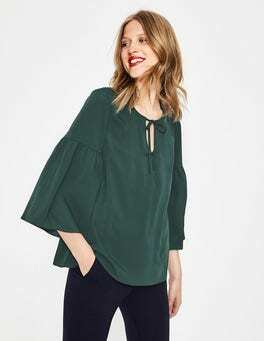 There's something undeniably romantic about bell sleeves and this drapey boho top comes with plenty of feel-good vibes. 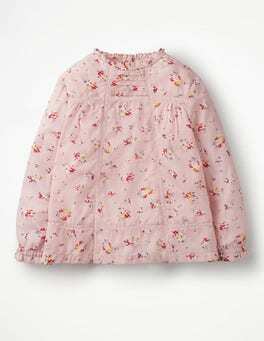 It has a flattering yoke front and a notch neckline with a pretty broderie and lace trim. The subtle gathers in the stretch fabric are your post-Sunday lunch best friend. Crafted from soft cotton with pretty lace around the neckline, this top is comfortable as it is stylish. The relaxed fit is super flattering, and we've added pintuck detailing on the front and sleeves too. The world cannot have too many ruffles, so we've popped some micro ones on the collar and cuffs of this silk-blend velvety top. The neckline is finished with subtle gathering at the front and a keyhole fastening at the back. Easy elegance? You're looking at it. We take our dazzling duties very seriously. That’s exactly why we made this top, with high-lustre all-over sequins. 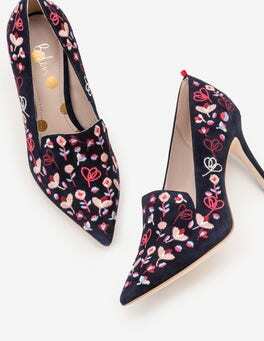 There's a grosgrain ribbon-tie fastening at the back for a feminine flourish. This is a PPP if we ever saw one – that's a perfect party piece, FYI. You'll feel ruffled – in all the right ways – with our long-sleeved blouse. We combined ruffles on the cuffs and neckline and floaty blouson sleeves. The soft 100% silk is oh-so indulgent against your skin, while a back keyhole fastening is the easy finishing touch. Today's forecast? Retro glamour. We’ve taken inspiration from ’50s fashion for this multi-way bikini top. Thanks to adjustable straps, it can be worn as a halter, over the shoulders or bandeau style. Fixed cups, side boning and a hidden shelf create a film-star-worthy finish. Special occasions, transitional days or just the usual 9-to-5 – you can always do with a touch of luxury from our slinky 100% silk top. Feminine ruffles around the neckline perfectly complement the soft gathering on the armhole and delicate keyhole on the back of this elegant sleeveless design. 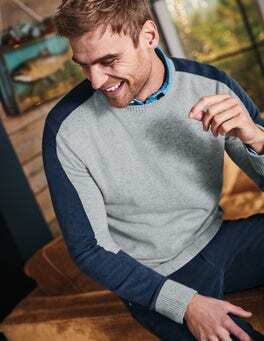 Otherwise known as the king of winter warmers, this lambswool blend roll neck is our chunkiest jumper yet. Knitted using three different types of stitches, it is a riot of texture, and is SO cosy your scarf can stay at home. Durable and endlessly versatile, it’s the ultimate cold weather comfort. With the coverage of a swimsuit and the fun mix-and-match element of a two-piece, the tankini has found its way into our hearts (and our suitcases). This halterneck top has a triangle shape with lightly padded cups for support, and an adjustable neck tie to help you get the perfect fit. …why we only use silky yarns sourced from Inner Mongolia. 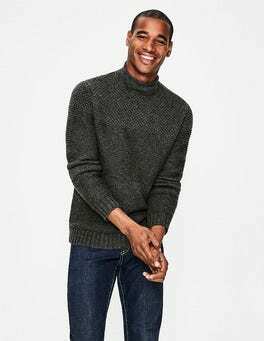 These are then knitted into this supersoft jumper that’s machine washable (yes, really), complete with stitch detail on the neck, cuffs and hem, plus flattering side splits. Layer casually over jeans or dial up the style with a pencil skirt. 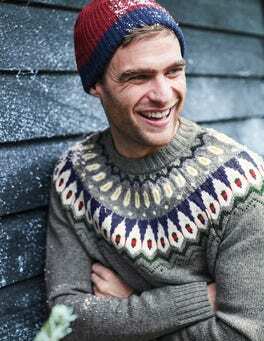 No winter wardrobe is complete without an irresistibly chunky, traditional Fair Isle knit in it. 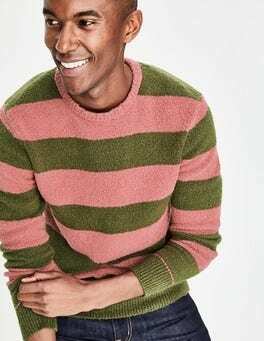 Made using time-honoured techniques from a lambswool blend, we’ve given this jumper a relaxed, comfortable fit so it can easily be worn over a shirt. Ready for some poolside relaxing? This ultra-flattering halterneck bikini top certainly is. With lightly padded fixed cups and a supportive band, it'll stay put should you decide to show off your diving skills. Choose from a range of colours to match (and mix) with our bikini bottom range. There are no two ways about it (actually, there's three), this multi-talented tankini is your new holiday must-pack. It features adjustable straps so you can wear it as a halter, on your shoulders or bandeau style. Fixed cups and a concealed shelf help to create a sculpted figure. It’s a fact – pompoms make everything better. Take our textured cotton top. A boat neck creates a flattering finish that’s ideal for throwing on over a bikini while on holiday. Gentle three-quarter-length blouson sleeves mean it's always evening-ready, too. Go from desk to daiquiris in this long-sleeved jersey top. 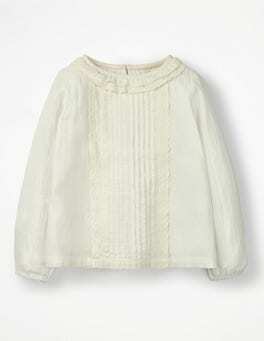 It's made from a cotton blend for a flattering drapey effect, with striking pleats. 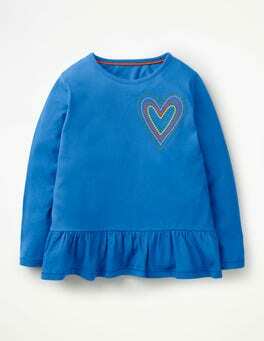 The grosgrain trim on the neck and cuffs adds an eye-catching detail. We've given this floral printed top some extra-special touches. Pintucks on the chest, lace detailing, frills at the neck and sleeves, buttons down the back... You get the picture. Fully lined and crafted from soft cotton, it'll be airy and comfortable all day long. If there's one thing we do well, it's spots. This time, we've combined them with the fluted sleeve-of-the-season to create a cool-yet-playful top you'll reach for again and again. Add a semi-fitted shape, flattering boat neck and dainty lace trims to the mix and you're on to a serious style winner. This jersey top is here to make your life easier. Crafted from a cotton mix, the high neck and elegant flared sleeves make it a smart option for work. It's finished off with the keyhole fastening – finally, everyday dressing made effortless. 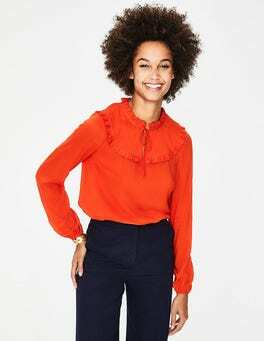 Be on fine folksy form in our '70s-inspired top, updated with relaxed fluted sleeves and a dipped hem for that floating-through-the-day feeling. Wear the neck open or tied and throw on some jeans for a breezy daytime look (or give your inner '70s screen siren what she wants: flared trousers). This top is officially triple-frilled (that's neck, yoke AND cuffs). Crafted from silky smooth midnight blue velvet, it was simply made for swishing through parties and dressing up on Christmas Day. Thanks to the soft cotton lining, it's as cosy as curling up by the fire. Work one minute, sipping cocktails the next? This button-sleeve wrap top can stand the pace. The bold V-neck and cinched waist create a feminine shape, with added elegance coming courtesy of the soft fabric tie. Choose a colour to complement your mood – and your trousers. If you thought velvet wasn’t versatile, think again. These velvet beauties skim the ankle for ultimate wearability. Soft to the touch, stretchy and comfortable, you may just find yourself forsaking your denim skinnies. Pair with a silk shirt for effortless elegance both day or night. Because 'everyday' doesn't have to mean 'basic', this easy-to-wear top has a bold contrast stripe running down the sleeves. Combine this sporty detail with floaty fabric, a flattering cut and just about any bottoms and what do you get? Compliments. This sleek top is a masterclass in multitasking. The block-colour is versatile, while the stand collar and contrast ribbon around the cuffs add character. Dress yours up with a figure-skimming pencil skirt or down with trusty skinny jeans. Our sophisticated sleeveless top is just begging to be taken on a night out. 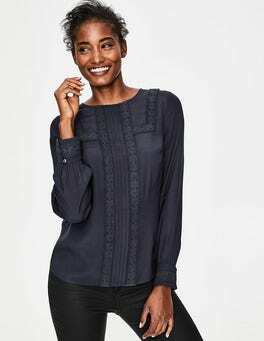 With smooth silky-effect fabric and delicate scallop detailing around the neckline, it’s the ideal outfitting piece to go with almost everything you own. Soft linen and balmy evenings are a match made in paradise. But whether you're in Mauritius or Manchester, this sleeveless top will keep you cool and calm when the sun shines. The easy-fit design is finished with delicate crocheted lace trim and flattering pintucks down the front. Meet the perfect party top – semi-fitted yet forgivingly stretchy, elegant, velvety and happy to be teamed with a skirt or trousers. The front is even jersey-lined for comfort, while grosgrain tape along the neckline contrasts with the shimmery fabric. Did someone say cocktails? It's all about the drape. Oh, and the frilled cuffs. Plus the pretty, detailed print. Don't be fooled by its deceptive simplicity: there's a lot going on in this semi-fitted top. It's actually all about everyday wearability (our favourite kind).